Over the next few days I’ll be posting my impressions and comments regarding the San Rafael SMART Station Area Plan. It’s such a large, complicated, and potentially game-changing document that it needs more than just a single post. Today we tackle parking. Subsequent posts will examine mobility, and the future of the area. So far, we’ve covered land use. With all these homes, all this retail, and all these commuters, parking could turn terrible without mitigation. Although the transit options will be the richest of anywhere in Marin, the rest of Marin will likely remain just as transit-poor as it is today, so the Advisory Committee explored ways to deal with incoming traffic and where to put all the cars. As you probably can guess, I’m not one in favor of parking. You could call me a Shoupite, I suppose: parking has its place, but it should not be required, and where there is a shortage of parking it should be priced until there is no longer a shortage. For regular drivers, this ensures they will always have a space roughly where they need it, mitigating the need for circling. For commuters, it means the commuter lot won’t fill up by some God-forsaken hour. For cities, it means new revenue to plow into their neighborhoods and transit systems. Excluding the 68 spaces that will be removed after SMART rolls into town, there are 144 metered on-street parking spaces (56 removed by SMART) in the Area Plan’s study area that hit 50% occupancy at peak usage and 395 off-street, free all-day spaces (12 removed by SMART) that hit 90% occupancy by 11am. This puts the total demand for off-street parking at for on-street parking at 100 and total demand for all-day parking at 389 spaces. It’s that second one that’s awfully tight, and likely why there is overflow. This poses a parking problem: how can the city accommodate new residences, retail, and offices while providing sufficient parking for new commuters and new shoppers without wrecking the transit-orientation of the area? The Area Plan believes it can be done by adding more parking, including the area within the downtown shared parking district, and through demand mitigation. As well, with over 90% occupancy of lots that are free, it would seems sensible to me to simply start charging for parking at the various commuter lots, and encourage owners of private parking to open it up to the public, or provide a mechanism for developers to purchase shared parking from those with a surplus, diminishing their own requirements. As for spillover areas, setting up parking meters with a residential parking permit system should ensure commuters don’t park in residential areas, while the city could allow enterprising residents to rent out their driveways for the day. Alas, the politics and mechanics of parking are a bit more complicated. Everybody wants free parking right in front of their destination. Downtown Tiburon, for example, is often accused of having no parking, but when the city actually looked they found scores of spots, just a little off the beaten path. 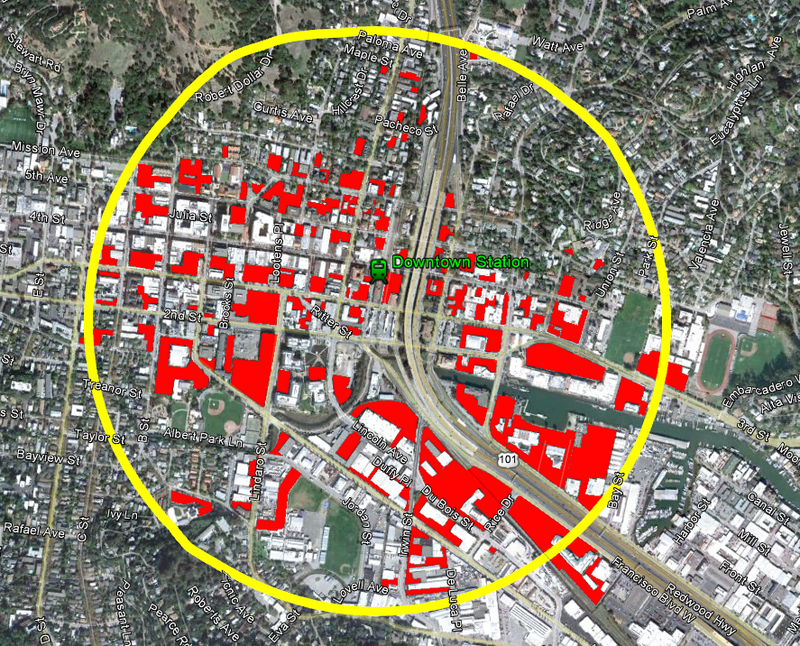 As well, with luck, San Rafael’s surface parking supply will continue to decrease. Pricing the parking supply implies that there are competitors to parking, such as transit, cycling and walking, but those are the topic of our next installment. Decreasing supply implies the same. The Area Plan takes non-car mobility seriously, but also suggests additional parking, as well as demand mitigation through car sharing. Car sharing is absent in Marin, mostly because our low-density cities and towns can’t support it, but studies have shown it dramatically reduces the need for parking. A single car share vehicle removes 14 cars from the road. The plan suggests allowing developers to forgo some parking if they support on-site car sharing. This is an excellent idea, as the more flexibility a developer has in its parking, the better the city will be. Still, I’d go one step further. As part of the car sharing rollout, San Rafael should give every household within walking distance of the redevelopment area free membership for a year, which would cost a pittance at around $184,000. Marinites are unfamiliar with car sharing, and this could serve to get people out of their cars and onto the sidewalks. Even with demand minimized, this is still a transit-unfriendly county, and parking will be needed for residents, commuters, and customers. To keep the burden off the developers, the Area Plan recommends including the area in the downtown shared parking zone, which allows retailers to count spaces in parking garages against their parking minimums, and building another parking garage along Third. I would hate to see San Rafael add yet another garage onto Third, especially in the middle of an important walking area and so close to other parking garages and lots. If a garage is really deemed necessary, a better location would be east of the freeway and extending the shared parking zone out to San Rafael High School and Unity Street. Montecito Shopping Center is overflowing with cars, and they’d probably like having a bit more breathing room. Besides, the newly tall buildings along Irving will want good access to a garage if they are to be built with less parking than normal. I’d recommend extending the parking zone to residences as well. With on-street parking at only 50%, some demand for off-street retail parking could be absorbed by the street, freeing up space in the garages and lots for residents to store their cars. Parking will be seen as a problem anywhere one goes outside of the mall, but properly managing it will make the place actually attractive rather than just giant parking lots and garages. Through demand mitigation (carsharing, transit, bicycling), innovative policies to broaden the parking supply, and parking pricing, San Rafael should be able to manage the influx of people to the area. If parking will truly be a problem, a garage east of the freeway will open up that area for business and support the high-density development planned along Irwin. Generally, a car is anathema to transit-oriented living, but there’s little transit to orient around. It is difficult to balance the needs of a transit-poor community with the needs of its transit system, but the problem of parking will remain a very real one for the area. I hope the city will strike that balance – managing demand and providing mobility without encouraging car usage.